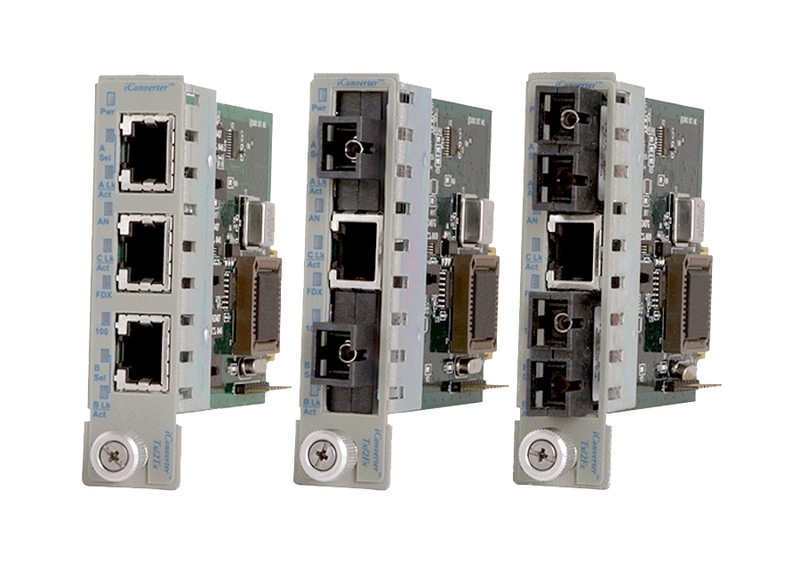 The iConverter Redundant Fast Ethernet modules are designed for use in networks that require fiber or copper link redundancy. With a link fault detection time of 100 microseconds, the Redundant iConverter modules provide the rapid response time required for mission-critical applications. All ports support Half or Full-Duplex operation, and the RJ-45 ports can auto-negotiate or be manually set to a required duplex mode. All ports support Link Propagation (Link Loss Carry Forward), Link Segmentation, Remote Fault Detection and Symmetrical Fault Detection modes to facilitate quick fault detection, isolation and reporting. iConverter Redundant Fast Ethernet modules are hot-swappable and can be mounted in a 19-Module (2U high) or 5-Module (1U high) rack-mountable chassis (19-inch or 23-inch) with redundant AC, 24VDC or 48VDC power supplies. They can also be mounted in a 2-Module AC or 18 to 60VDC powered chassis, or in a 1-Module AC or DC powered chassis. In the application below, the iConverter Tx/2Fx enables 100Mbps fiber link redundancy to an IP camera that has an RJ-45 copper port. 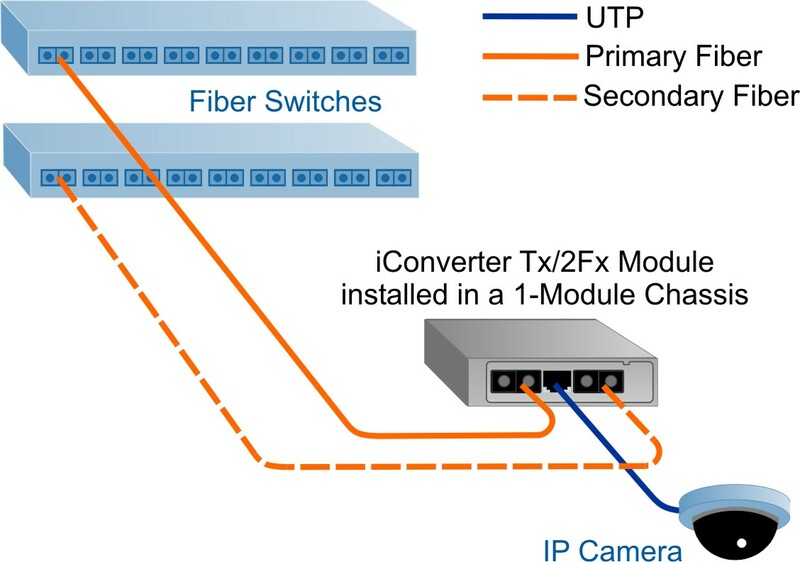 Fiber is run to the camera from a primary fiber link connected to a fiber switch, and secondary backup fiber link is run from another fiber switch for failover protection. Both links connect to the fiber ports on the Tx/2Fx module installed in an iConverter 1-Module Chassis. If the primary fiber link goes down, the secondary backup link becomes active and maintains network connectivity to the camera via the RJ-45 port on the module. This configuration can also provide fiber redundancy to Point of Sale equipment, Wi-Fi access points, and mission-critical Ethernet switches in financial, healthcare and military networks. 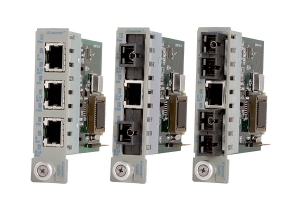 In this application, iConverter Tx/2Tx modules are installed in 1-Module Chassis and deployed in a bookend configuration between two Ethernet switches. The Tx/2Tx modules provide primary and secondary backup UTP copper cable links between the Ethernet switches. If the primary link goes down, the secondary backup link becomes active and maintains network connectivity between the switches. In this application, iConverter Tx/2Fx modules are deployed in a mission-critical star topology network. In the upper left, Tx/2Fx modules are installed in an iConverter 19-Module Chassis to provide high-density distribution of redundant fiber links from a third-party Ethernet switch with RJ-45 copper ports. 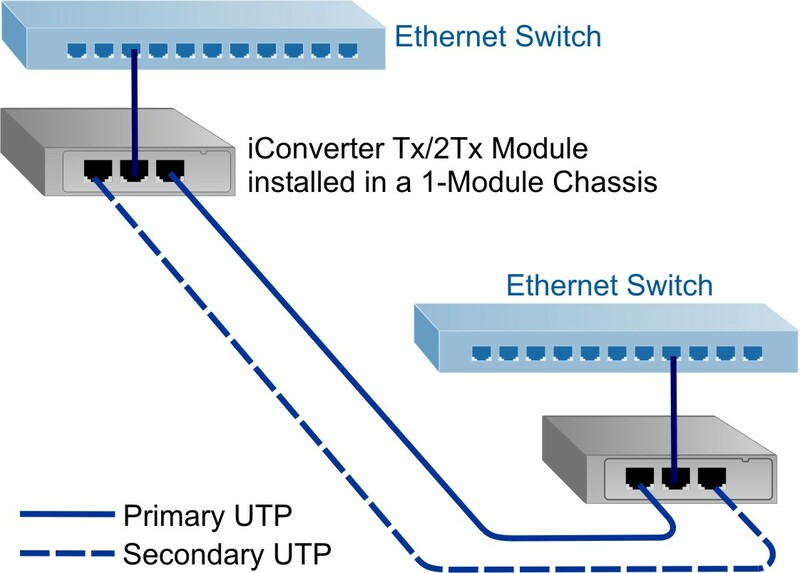 At each end of the redundant fiber links, the primary link and the secondary backup fiber link are connect to the fiber ports on the Tx/2Fx module installed in an iConverter 1-Module Chassis. If the primary fiber link goes down, the secondary backup link becomes active and maintains network connectivity to the network switch via the RJ-45 port on the module. The iConverter Tx/2Fx and Tx/2Tx can be used in managed or unmanaged applications. Management provides remote configuration, monitoring and trap notification. Management is accomplished by installing an iConverter Management Module (NMM2) or Network Interface Device (NID) in the same chassis. The Management Module can be accessed via SNMP, Telnet, and serial port. They can be managed with Omnitron’s intuitive, graphic-oriented NetOutlook SNMP Management Software or third party SNMP management software. Management via the Telnet and the serial interfaces have an easy-to-use, menu-driven interface. The management software can override the physical DIPswitch settings such as Link Propagate, Link Segment or Remote Fault Detection. Some real-time parameters that can be monitored included port state (active, standby), link and data receive status. Other parameters include module type and model, hardware and software revisions, serial numbers and a user-defined identifier. The iConverter Tx/2Fx and Tx/2Tx supports SNMP trap notification for the monitoring and notification of different network events. Specific events that generate traps include module insertion and removal, and port link-up and link-down. Trap monitoring of specific events can be selectively enabled or disabled by the network management software.